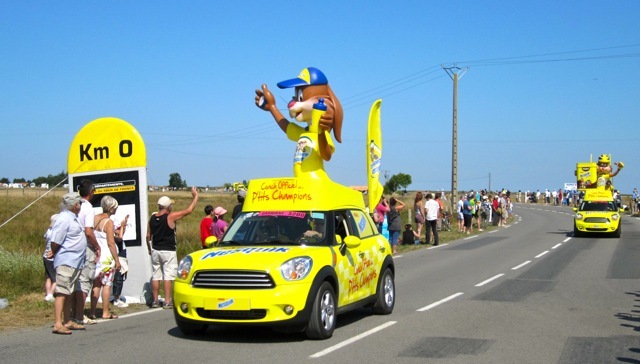 The big day has arrived, Le Grand Depart at the infamous Pasage du Gouis in Vendee. The Passage is a submersible road linking the mainland with the island of Noirmoutier and is only accessible at low tide. 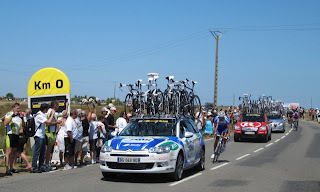 The Tour last raced here in 1999 for Stage 2 and a crash on the slippery stone road caused a major split in the peloton, resulting in a 6 minute gap that famously gave Lance Armstrong a break over another favourite Alex Zuller, who eventually finished second, 7 minutes behind Armstrong. 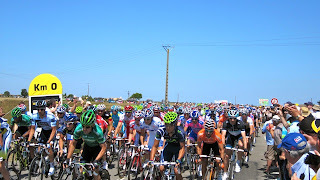 We arrived by bus from Nantes at Passage du Gois with time to stake out an excellent vantage point at the race start point and watched the publicity caravan go through an hour or so prior to the riders coming through. As the official starting flag was dropped by Christian Prudhomme, we saw three French team members attack the peloton right from the gun and they stayed away right up until 20 km to go, ensuring great publicity for French cycling on the opening day. We headed off on our 70 km ride for the day from Passage du Gois back to our hotel in Nantes in time to catch the last 30 km of the race. 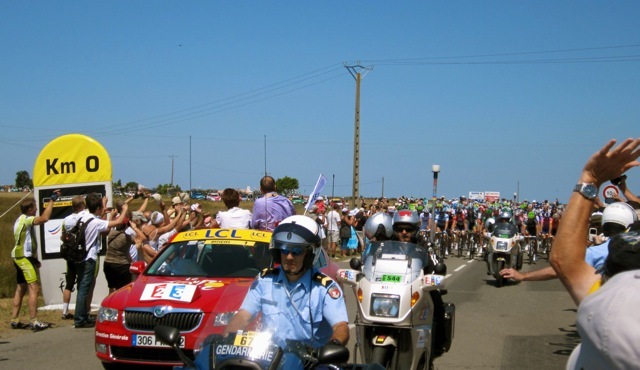 What a spectacle it ended up being with a crash at the 8 km point that saw Contador lose valuable minutes as he was caught behind the crash. 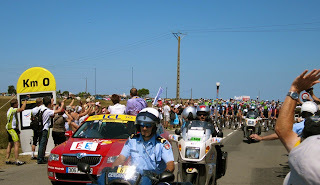 It ended up being a great result for Cadel Evans, whose team had done well to position him at the front of the race and out of harms way. 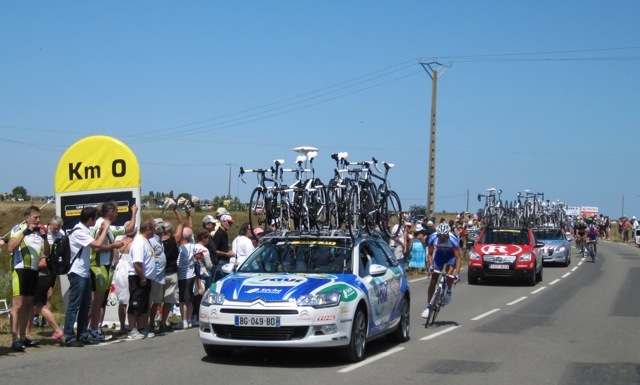 The pre-race favourite Phillipe Gilbert lived up to the big wraps and his Spring Classics form to show his powerful uphill finish that he is famous for to take a great Stage win from a fast finishing Cadel Evans. Our ride back to Nantes was into a strong head wind that gave us all a decent workout on a hot 32 degree day, however these Plane Trees gave us a little respite. 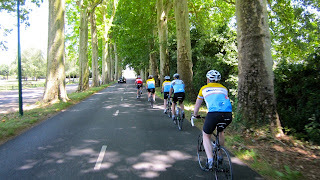 These trees were originally planted by Napoleon to ensure shade for his troops as they route marched around the country. Thanks for including me in your blog. France but I love to know that someone I know is enjoying such an experience and that gorgeous French countryside that I love so much myself. I looked for you on yesterday as I watched some of it on TV. Hey Pen what is the payoff to you for this "easy holiday" of Pete's? NY for a week. Bron Pete tells me it is work ha ha!!!! !